NASHVILLE, Tennessee — The only bad thing about the NCAA tournament is that it dwarfs everything that comes before it. Months of effort and excellence are reduced to prelude. Great games are forgotten. Carve out a slice of memory for Tennessee 82, Kentucky 78. The Saturday semifinal in the Southeastern Conference tournament deserves it. This was a game played on a Final Four level in a boiling, raucous atmosphere — one of the few times in SEC history where Kentucky blue didn't overwhelm everything. It was the first time in a long time, maybe since the Kentucky-Arkansas brawls of the mid-1990s, that this tournament has had two Top 10 teams collide with high NCAA seeding and conference supremacy on the line. And then the game lived up to the hype. 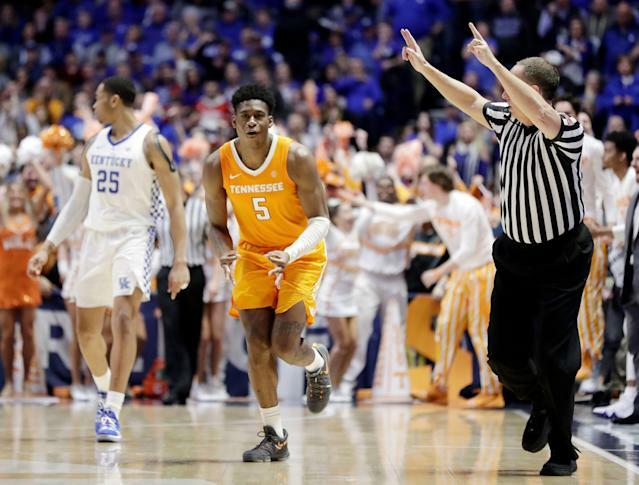 It was tense and intense, with sustained drama from a torrid opening salvo through a steely Tennessee comeback in the final minutes. "Honestly," said Vols senior Admiral Schofield, "that was one of the funnest games I've ever played in." He's played in 127 of them as a collegian. This one will be hard to top. The Wildcats are really good. The Volunteers were a smidge better. They both should be an absolute handful in the next tourney. But wait, there I go looking ahead. First let's look back at this battle. 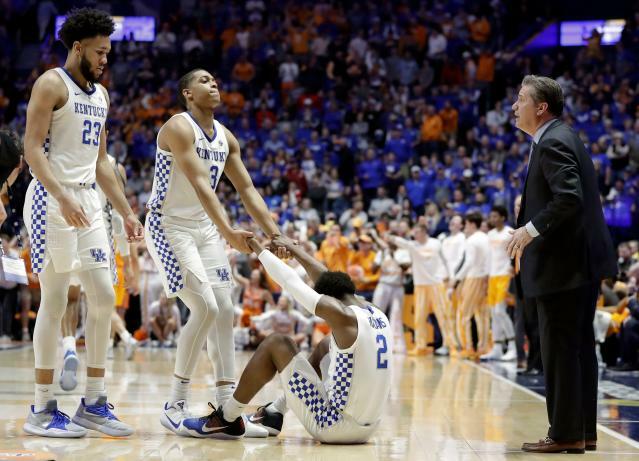 Tennessee hit Kentucky with a 7-of-9 3-point shooting barrage in the first half, and the Wildcats never blinked. They were down just two points at halftime, even with star P.J. Washington sitting out 14 minutes with foul trouble, thanks to the usual assault on the backboard. The Volunteers finally started missing threes in the second half — eight straight, in fact — and UK seemed to assert control. When the 'Cats budged the lead out to eight points with 2:58 remaining, a potentially classic game seemed doomed to an anticlimactic ending. "We should win that game," John Calipari said. "They said, 'You're not winning the game. We're not stopping.' "
Tennessee would not be stopped. Grant Williams, undersized against Kentucky's long front line, went around, over and through the Cats for five straight points to make it 72-69. Then, in the final two minutes — when the shots absolutely had to fall — the Volunteers dropped a trio of threes on Kentucky. Schofield hit one to make it a two-point game. Then Williams swished one from the corner — the first three he's made in two weeks — to give Tennessee the lead again at 75-74. And after a Williams offensive rebound and a timeout with 38.5 seconds left, Kentucky back in the lead by a point, the Vols hit the dagger shot. Schofield had an opening to drive into the lane and perhaps all the way to the basket, but he spied Lamonte Turner out front. "When I saw him open, you've got to give him an opportunity to knock it down," Schofield said. The Admiral's confidence in Turner didn't seem particularly well-founded. Up to that moment, the junior guard was 1-for-19 from 3-point range this March. But he stepped into the shot and let it fly, as 20,933 fans collectively held their breath. When it swished with 29 seconds left, Tennessee had the lead for good. "Honestly, I've been thinking too much," Turner said. "I've been overthinking my shots." He did not overthink this one, and the veteran Vols put the game on ice with a defensive stop and four free throws in the final seconds. Now it's Kentucky's job not to overthink this loss. The only real cost would seem to be a path through the South Region in Louisville, which would be a geographic gift a likely No. 2 NCAA seed doesn't deserve. Beyond that, the Wildcats can leave Nashville still feeling very good about their chances over the next couple of weeks. Yeah, there are some issues to address regarding the late-game collapse. Kentucky didn't handle a late switch to zone by Tennessee terribly well, and there were a couple of late turnovers by freshman guards that Calipari attributed at least in part to fatigue, which is on him. Cal shortened his guard rotation to a perilous degree given the back-to-back games Friday and Saturday, and it was costly. The only backup guard who played was Immanuel Quickley, and he only saw nine minutes of action. Ashton Hagans and Tyler Herro both played 38 minutes, a day after logging 29 and 36, respectively. But all things considered, this was a comeback Tennessee made happen more than Kentucky. This wasn't Cal blowing a nine-point lead in the final two minutes against Kansas in the 2008 national title game. This was a bunch of juniors and seniors making clutch play after clutch play to pull out one of the biggest wins Tennessee has ever had. The Vols will play Sunday for the SEC tourney title, something they haven't won in 40 years. That's worth getting excited about, even if it happens on Selection Sunday. And if Tennessee does cut down the nets here, this semifinal triumph is likely to be the game everyone remembers. At least it should be. Don't let what happens over the next three weeks wipe it from your memory banks — because the games to come aren't likely to be as good as this one.